We’ve been busy the past few weeks readying a brand new app for Hootsuite. Synaptive Streamnotes is its name, and Social Network post saving is its game. With support for popular save-to services such as Evernote, OneNote and Pocket, as well as the ability to post to Tumblr blogs and save-as PDF and CSV files, Streamnotes has everything you need to save posts where you want. 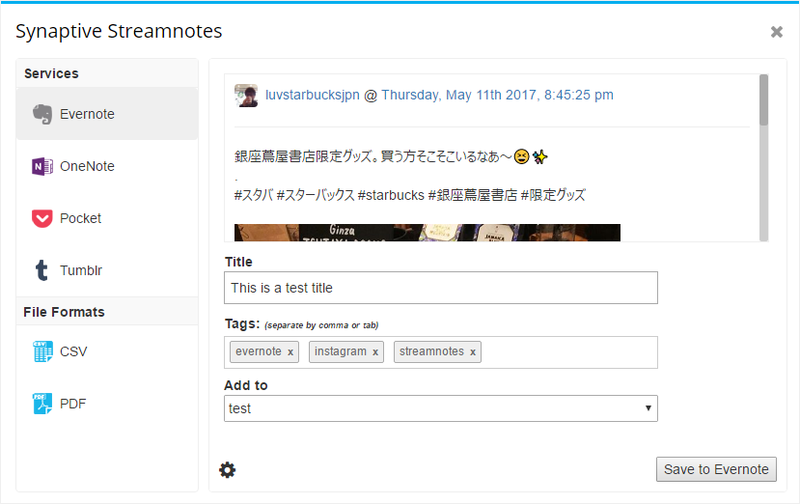 Streamnotes allows you to save posts directly from Hootsuite native streams for Twitter, Instagram, Facebook and YouTube. But, it doesn’t stop there. Streamnotes is also available in our Streamview apps for Twitter, Instagram & YouTube as well as in our RSS reading app, Hootsuite Syndicator. We’ll be adding more “destinations” for your posts in the upcoming weeks and months, so if you have any requests, we’re listening! If you’re using one of our Streamview apps, or Hootsuite Syndicator, Streamnotes is available to you now. If you want to get Streamnotes in Hoostuite native streams, you’ll need to install the Streamnotes app. For more info on the Streamnotes app please visit the Synaptive web site, or the Hootsuite App Directory.